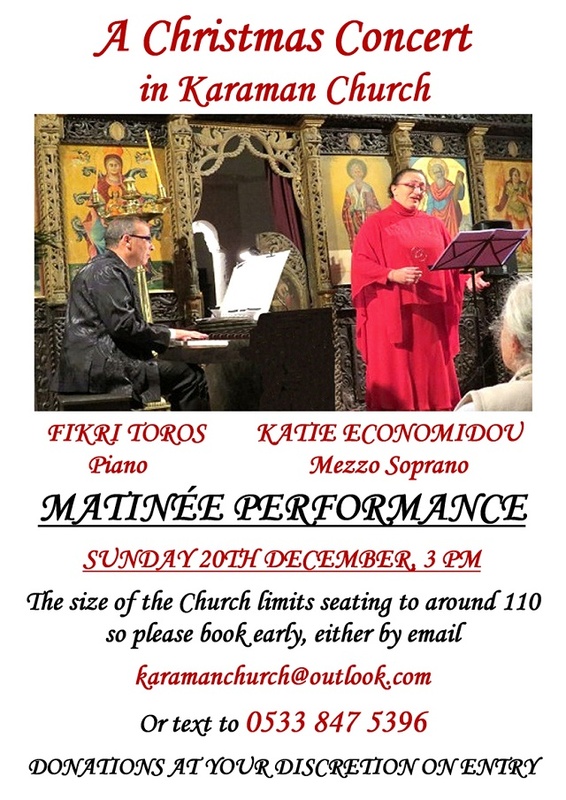 Fikri Toros and Katie Economidou will present a variety of Seasonal Themed music in Karaman Church. This will be a Matinée concert at 3pm on Sunday 20th December 2015. Seating is restricted by the size of the church so please book as soon as possible, either by emailkaramanchurch@outlook.com or text to 0533 847 5396. Donations at your discretion on entry. Refreshment will be available in the Levant Restaurant and the Crows Nest afterwards, booking advised. Katie Economidou: Studied classical singing in Cyprus and in London, where she was awarded the Diploma of Recital Performance at the Guildhall School of Music and Drama in 2003 with Merit. She has performed in London, Germany and Greece. The breadth of styles she studied includes German Lied, Italian and French arias, Sacred and Contemporary Music. Katie’s bi-communal commitment led to the formation and training of bi-communal groups and the bi-communal choir. Recently, together with her associate Dervish Baha, they earned the Sir Stelios Award for their Mediation Consultancy Initiative. She has a BA in Politics and Philosophy from the American University of Beirut (USAID Scholarship) and an MA in International Conflict Analysis from the London Centre of International Relations with Merit (Chevening Scholarship). She is a multilingual Tourist Guide and is married with two daughters. Fikri Toros: Was born in Nicosia where he returned in 1984 following his education, school and university, in the UK. Back home he became the director of the Toros Group of Companies. Fikri began piano studies with Yildan Birand in 1997 when in his 30s. Subsequently he studied with Yilmaz Taner, Maka Borchasvili and Rauf Kasimov. Today, Fikri provides support to many local charities, giving recitals or accompanying other musicians at chamber concerts. He is the pianist for the ‘Cypress Classical’ folk ensemble. Amid all this, he has managed to find time to attend master classes and also to perform at St. John Smith square in aid of the Pro-Cancer Research Fund.